Q: What is a "lonely cache"? A: An active geocache with no Finds logged during the last year (365 days). Q: Why do caches become lonely? A: Remote locations, evil hides, hard puzzles, long multis, and missing containers are all possibilities. Finding lonely caches can qualify you for certain Challenge Caches and some people just enjoy the challenge of seeking these caches. Q: How does one make a list of lonely caches? A: At this time, neither Pocket Queries nor GSAK's Get Caches function are effect methods of determining which caches are lonely. I have made this tutorial to show the method I use, which includes the use of GSAK. If you know a better way, please let me know. 1. 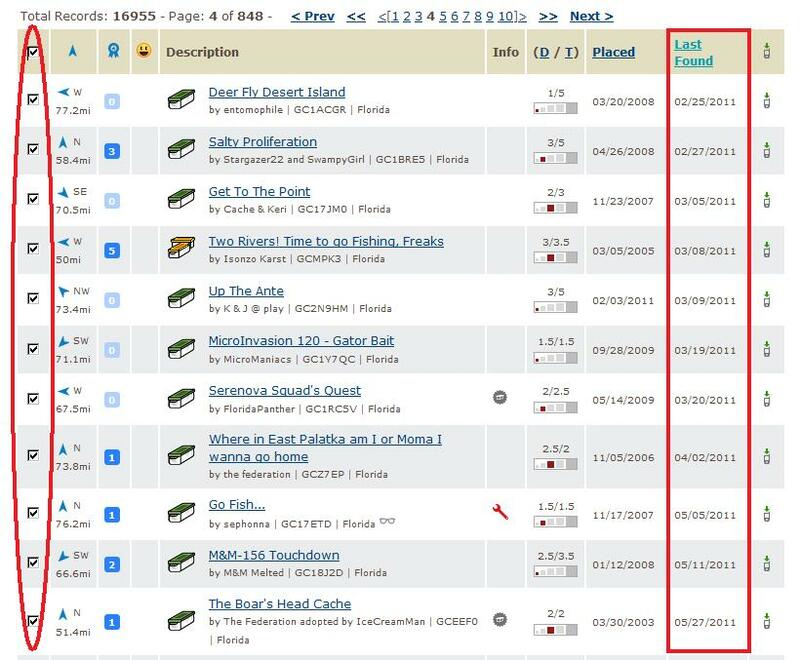 Go to the old Geocaching Search. You may wish to search a certain radius around your home or for an entire state. 2. This will give you a list of caches which may number in the thousands. Each page of results shows 20 caches. Click "Last Found" to sort your search results by that column. 3. With the list sorted, the first listings will likely have no Last Found date because they are Events and new unfound caches. 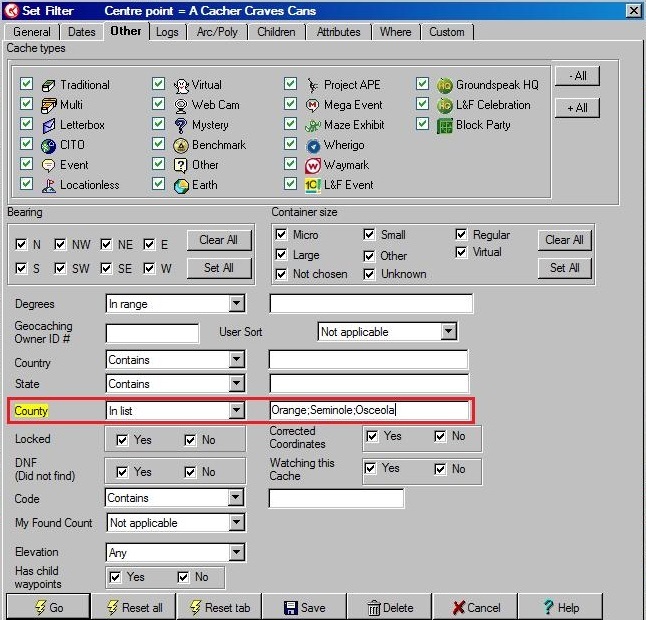 Check the box by each cache you want, or use the checkbox at the top of that column to select all caches on the page (20 per page). 4. 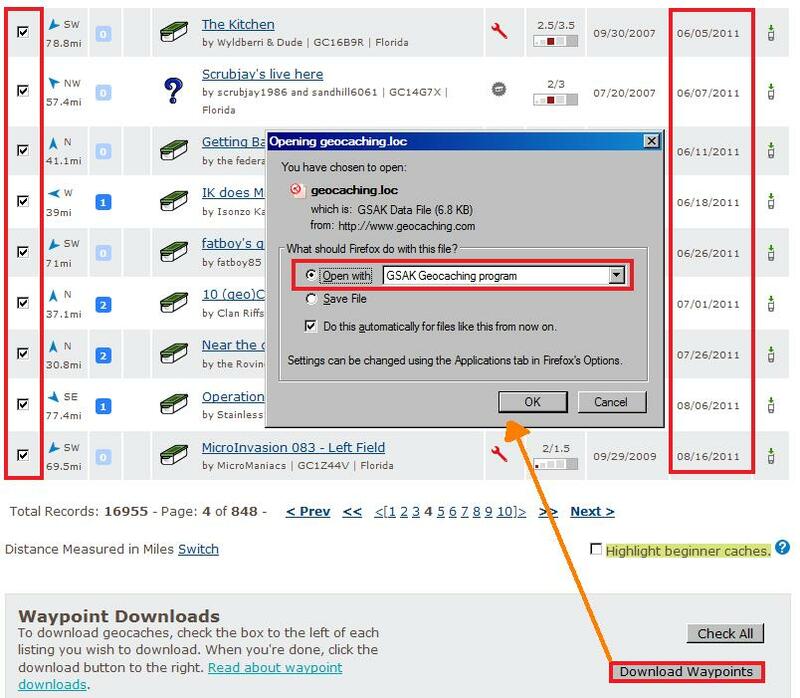 At the bottom of each page of results, click Download Waypoints then open the file with GSAK. This will usually be the most time-consuming part of the process since there are only 20 caches per results page. I use a seperate GSAK database for tracking lonely caches. 5. Once you have all the lonely caches you want in GSAK, you need to update their information in GSAK because you have so far only downloaded their basic data (LOC) not the full cache information (GPX). This requires GSAK 8 or later which uses the Groundspeak API. "YB" in the County Update field will assign a County name to each cache which is useful for later filtering. 6. 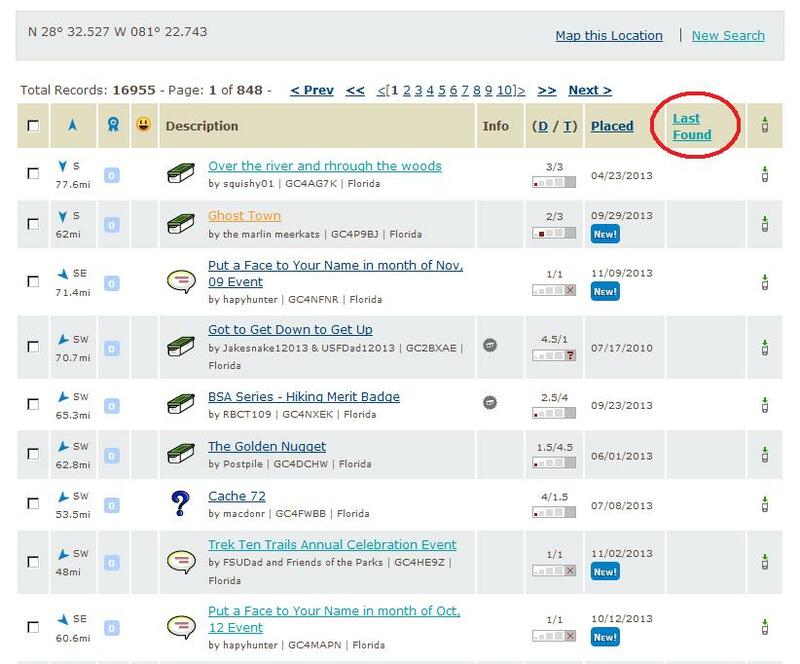 After the cache data has been updated, make sure all caches in your database are lonely (geocaching.com's search occasionally gives the wrong Last Found Date in search results, but not in GSAK) and delete those that aren't. 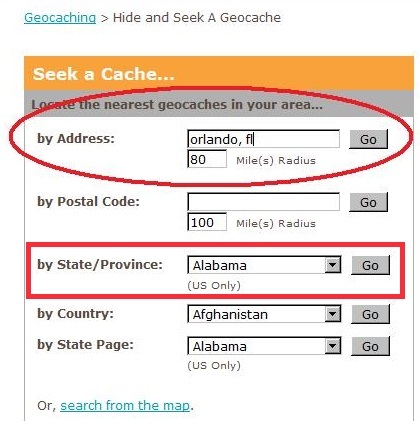 Depending on how you want to use this lonely cache database, you may run other searches to remove caches based on their geographical location, DNFs, D/T ratings, or other factors. You may want to have a Bookmark List of lonely caches meeting some criteria ("Lonely List") for other people to use. 1. If this is a new list then first you need to create the Bookmark List on geocaching.com (skip this step if you are just updating an existing list). The first two checkmark boxes allow other geocachers full access to see (but not edit) the list. The last option notifies you each time the cache is logged so you know when a lonely cache has been found and can be removed from the list. 2. 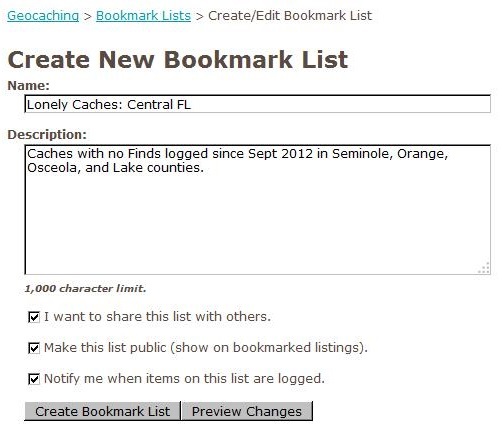 Filter your GSAK database as neccesary to get the caches you want for the bookmark list.